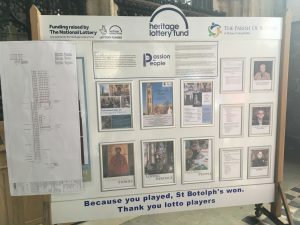 On Tuesday 31st July, 4pm at St Botolph’s Church, many people gathered to hear the very exciting news that The Parish of Boston has received a confirmed National Lottery grant of £1,166,700 for its ‘A Passion for People’ heritage project. 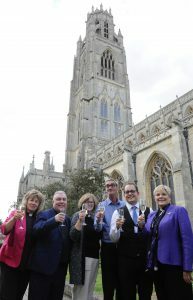 The total cost of the project, with money raised by the Parish of Boston will be £2.7million. Supported through the Heritage Lottery Fund (HLF), the project includes the repair of the West Face of the tower and tower roof, urgent repair and development of our pews, installation of underfloor heating and the construction of draft proof, flood resistant and accessible porches on the North and South doors. An educational interpretation and activity scheme will also be created, telling the stories of the people of town and church. 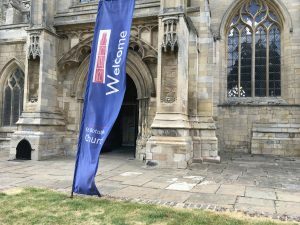 St. Botolph’s Church is one of the largest parish churches in the country: its daily life revolves around prayer, worship and community engagement. The church hosts many secular events, working with organizations within the area. In recent years it has hosted concerts and events in its role as a centre for the community life of the town. St. Botolph’s acts as a hub for the community and has been described as the very ‘heartbeat’ of Boston. It is open every day form 8:30am until 4:00pm. It could not function without its team of volunteers. St. Botolph’s is Boston’s premier tourist attraction, welcoming in the region of 100,000 visitors a year. They come to visit one of the most historically significant churches in the country with approximately 5000 climbing its famous 83-metre-high tower every year. 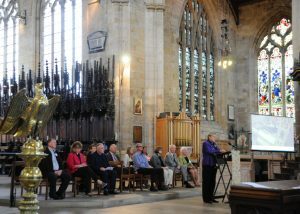 My Lord Lieutenant, friends and supporters of St Botolph’s Church. It is wonderful to see you all here today for this important announcement and we are humbled by your constant and unwavering support. make new ones. We long to play our part in being an agent of community transformation and flourishing. For this task we know that we have needed the right clothes to wear. When I was appointed I arrived and my first task was overseeing recovery from the 2013 flood. As well as to a church and town in grief. The philosopher Kierkegaard said that ‘Life can only be understood backwards; but it must be lived forwards.’ I must confess in 2013, being new myself, I had not realised the depths and significance of this grief until I looked back and reflected upon it. building. The running costs of the church were spiralling. With some bills impossible to cover or reduce. As we could not possibly think of having the church closed during the week our staff and volunteers are vital to the way we serve the town. We open every day of the week and last year we had 150k visitors – which is a figure that I find staggering. The running costs of St Botolph’s reach 250k a year and this is without any building conservation. There is no way these figures can be met from our congregation, indeed how unfair would it be to expect this. This amazing and iconic building belongs to everyone who has ever seen it, let alone visited it. Not only is it an antenna to the good news of Jesus Christ but, throughout history, it has been a symbolic homing beacon to millions of people, a place of worship and a sacred sanctuary for all those who visit. began to develop in earnest. Many consultations, reports, meetings, writing, sleepless nights and much fundraising later a bid was submitted in 2015 entitled: Inspiring Journeys Moving Stories. This bid was rejected, which was a big disappointment. However, we listened to the feedback – and we looked more closely at the objectives of the HLF and started to develop the bid around them. Of course the building is important and our heritage is important BUT the HLF want to use their grants to build community and transform the lives of those who live in it. This is so the community will be a better place to live because of the projects they support. The bid was rewritten and submitted in May 2016 and many of you will have been here for the announcement in November 2016 – which was an announcement that we had a grant to further develop the project – which we have duly done. Many of you know it has not been without its difficulties. Indeed in February we thought it would not be submitted until next year. We had concerns around the area of spiralling costs and making sure we had enough funds. We are still short of about 170k so if any of you are feeling generous this afternoon, any contribution however small or large, will be very gratefully received. Anyway -finally we were able to submit the bid (and some of you may have seen the picture on Facebook when we finally pressed the send button) in February of this year. The project submitted includes – the repair of the West Face of the tower, tower roof, urgent repair and development of our pews so we have. 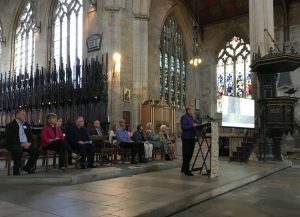 more space and adaptable space, underfloor heating, draft proofing, flood resistant and accessible porches on the North and South doors, as well as an educational interpretation and activity scheme telling the stories of the people of town and church. May I take this opportunity to thank you all for your unwavering support. This would never have been possible without the support of the congregation, the volunteers and all they contribute to the life of the Stump. Particular thanks go our Churchwardens, for the team who pulled all the stops out to get the bid in – namely Chris, Adam, Sue and Will and all the other staff in their important supporting roles. In addition to this, it has been a huge privilege for me to minister alongside Steve, Sue, Chris and Jane whose ministries have enabled me to concentrate on this vital piece of work. We look forward to not only starting but completing, this project and in God’s name we pray for its success.